Technology today drives the performance of business, and it is also a major factor in your organization’s total operational costs. But, when it comes to choosing the best technologies for your business – technologies that are scalable and future-proof – how confident are you that your IT team is choosing the most cost-effective solutions? Does your IT Department really understand how technology impacts your organization’s bottom line? Keeping up-to-date with the latest hi-tech breakthroughs is critical in keeping operating expenditures down and competitive capabilities high. New tech breakthroughs range from cloud computing technologies to virtual desktop infrastructures, hosted backups, and beyond. All of these new innovations have the power to significantly reduce costs, deliver awesome ROI, and minimize the need for new hardware purchases – all while adding new layers of functionality to your business. Surplus IT budgets can even be applied to other innovations and endeavors in your business. The downside for your IT department? These innovations also reduce overhead. The fact is, IT personnel may not be making the most cost-effective decisions for your business. Where business heads are looking to maximize profitability, your IT staff may have other factors driving their decisions. Fortunately, your business is not alone on the hunt for the most cost-effective IT solutions. At Comprehensive Business Solutions, we have been an insider source to many business execs over the years. We’ve worked with clients in South Florida for over twenty-five years. In that time we’ve learned some secrets about optimizing IT environments. Our goal is simple: to help increase financial growth and progress using the latest technologies, and we never hold back the truth. Want to discover the surprising truths behind solving IT budgets – before they cost your business dearly? 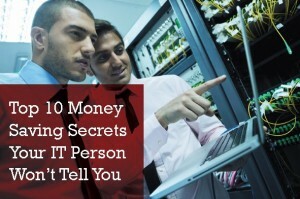 Download our white paper, Top 10 Money Saving Secrets Your IT Person Won’t Tell You.